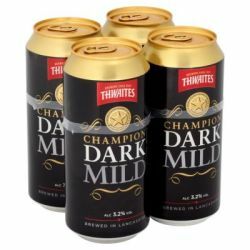 Filtered version of Thwaites award winning mild, which has been sold as Best Mild, Mild, Nutty Black, Dark, Dark Mild, and Champion Dark Mild. Keg version is 3.3% abv. This beer is filtered and pasteurised to ensure a consistent flavour and longer shelf life. The beer is dispensed under CO2 pressure, which gives it an effervescent flavour. A deliciously dark beer with a rich, roasted flavour that has a delightfully balanced bittersweet taste with a nutty finish. Can, Tesco. Dark brown, white foam. Sweet and malty, hint of treacle, fruit. Slightly thin but it is only 3.2%. Low bitterness, but drinks easily. Drinkable simple mild, great for a session. 50cl can. Brown black color. Thin brown head. Light medium sweetness, light bitterness. Medium body. Aroma and flavour is caramel, nutty, cacao, vanilla. Can from Aldi. Pours dark brown with a single finger tan coloured head that goes away quickly. Aroma of toasted malts, molasses...Taste of initial malts, then molasses, light caramel, toffee, some bitterness....a little grainy though. Not great. Pours dark brown/black with quickly disappearing head very simple drink at only 3.2% abv tastes a little weak and lightweight, might be me but just didn’t get nuts anywhere in arms taste or finish. Dark brown with thick, brown head that dissipates quickly. Strong, undifferentiated aroma which disappears quickly. Dark, a bit bitter, grainy on the finish. A curious mixture of thick and watery. Tan head dissipates to lace. Opaque black. Aroma of malt and molasses. Smooth and lightly sweet. Medium body. Can shared with McTapps offering a black look, some roasted malt and maybe a few nuts in the aroma. Due to its watery taste its a bit passionless and offers not really that what I would call a deep body. Like a golden Pilsner which was filtered to death. Pours out of the can in a deep dark brown colour with low steady head and medium body. Aroma of malt, roast, torf, leaves, oak, wood, barley and wheat. Mild finish. Nothing special. Can from 7-11 Taipei. Mellow dark bitter. Nut , malt and bittersweet taste. Not a bad mild at all and at 3.2% can be drunk all day.